MPow Selfie Stick Review – Better pics for your money? Does the MPow Selfie Stick Really Work? We have talked about a few different versions of selfie sticks in the past, but with the kids being back in school they always want the latest gadgets that are going to help with their popularity and the MPow Selfie Stick just may help them with that. The MPow Selfie Stick is designed for those who love to take “selfies” and want to include as much as they can into the picture. The claim is that by using the selfie stick you can control the action and still be able to extend the camera out to a distance that allows you to get way more in to the shot. The hype is quite obviously found in the fact that the art of taking selfies or pictures of oneself with their own camera for the uninitiated has become a clearly more than a passing fad of the IPhone generation. They have become and icon in and of themselves with acceptance in every type of culture and media. The cost of the MPow Selfie Stick is a very reasonable $9.99 at Amazon.com. This seems pretty comparable to other similar units sold on Amazon as well. Not much in the way of commitment required for the selfie stick, just the willingness to pick the shots you want to take and when you want to take them. The stick folds up to a size that easily fits into a purse or glove box when not in use. The MPow Selfie Stick is a pretty handy gadget for those who love to take their selfies. You can easily control the camera action by syncing it to your Android or iOS operating system. 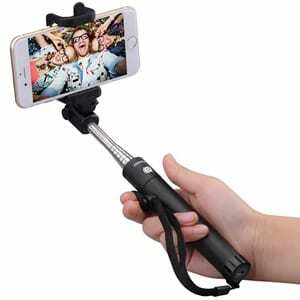 The selfie stick extends to a reasonable 31.5 inches when fully extended and retracts to a handy 7.1 inches when fully retracted making long enough to get a decent selfie with a ton of background and easy enough to store at a shade over seven inches. The head rotates a full 270 degrees in order to get a good photo and is easy enough to operate with the Bluetooth compatible remote control doing the operating once paired up with your phone. It also has a handy strap for the wrist so you do not drop the unit and your phone in the heat of action. The MPow Selfie Stick is well constructed and easy to use. It offers a very good alternative to taking selfies that your phone in hand cannot offer. You simply get a chance to add way more background when the camera is extended far from the body. With the popularity of the ever present selfie, having one of these gadgets is pretty much standard issue for anyone is loves a good selfie and judging by the amount of them we see in the media these days that would be just about everybody. We feel the MPow Selfie Stick deserves a thumbs up rating. The MPow is Well-made and actually really fun to use. If you love your selfies than you will love the MPow Selfie Stick.If you are looking at buying selfie sticks as a gift for several young ones then you may want to offer them each something a little different. Take a look at a few of the the other selfie sticks that we have talked about in the past. What do you think? Does the MPow Selfie Stick work or not?